Mr. Texanerin is coming back today after being gone for two months and I still have a LOT of cleaning to do. I’ve just been throwing stuff on the floor since he left as well as using his office as a storage room for… everything. And so I’ve been cleaning for days. And days. But I thought I’d quickly share these with you since it’s been a while since my last post. That and peach season is coming to and end! Noooo. Like I mentioned in my raspberry crisps post, I don’t like eating leftover crumbles and crisp. They just get mushy and nasty. Not a problem when you only have four servings! The topping in these was actually pretty nice. I didn’t know to expect with a grain-free crisp, but I was happily surprised. Kind of chewy / crispy. This definitely won’t be the last time I make these! And the ginger makes them so much more interesting than plain old peach. I didn’t have any ice cream when I made these but ice cream would most definitely make these even more of a treat. But then again, ice cream always improves everything. All the time. I used Greek yogurt instead. And those blueberries don’t even belong there… I just ran out of peaches. Preheat your to 350°F / 175°C. Spray four 1/2 cup ramekins with non-stick cooking spray or butter them. In a medium bowl, combine the first three ingredients and then add the peaches. Set aside. In another medium bowl, combine the dry topping ingredients, and then add the wet. Stir until combined. 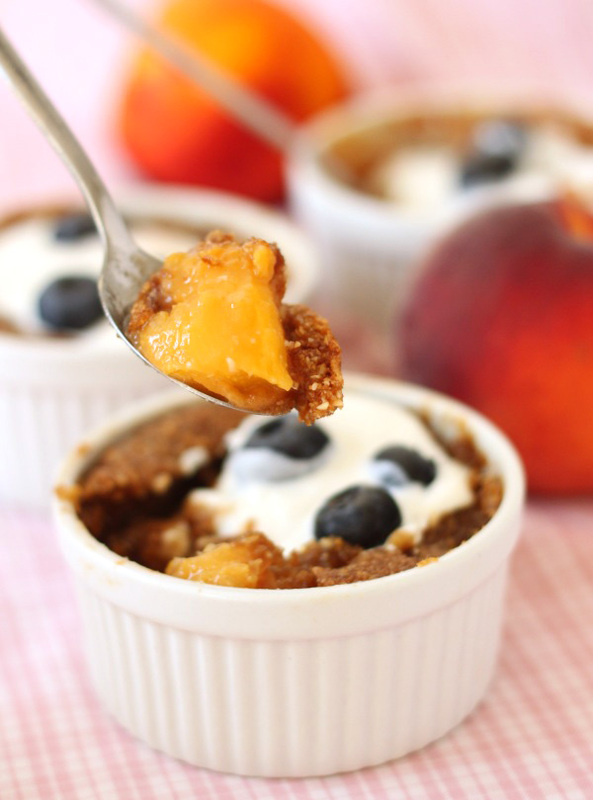 Divide the peach mixture among the four ramekins, and then do the same with the topping. Bake for 25 - 28 minutes until bubbling and lightly browned. 15 comments on “Grain-free Individual Ginger Peach Crisps” — Add one! Hey everyone – I'm still pooped from the cleaning and party planning / executing and need to sleep but wanted to say thanks for all the nice comments. I've loved getting every one… a nice break from the cleaning. :D Thanks again! Oh my gosh, those look so cute! AND delicious. I love that they're portioned because typically, I don't like to portion and instead will attack the "regular-sized" dish with a spoon and a huge appetite. Yummy! These sound amazing! Hope you're loving having Mr. Texanerin home! Those sound delicious! I'm with you.. I cannot stand mushy or soggy :-( ew. Peaches… ohh peaches.. You're golden and soft and sweet and even a little furry. It's by far my favorite stone fruit and its always the things you love that are hard to come by. Good big peaches are rare in Asia. or. they come with a hole in your pocket. ugh cleaning – but a treat like that is nice reward that I would give myself too :-) looks yummy. Gosh I hate cleaning!! so good luck with that one :-) although I am sure you can't wait for your hubby to get back home. I have enjoyed peaches a lot, even though I have not posted anything peachy in the blog:-), I left it for the book :-) I like your idea of individual crisps, and the option of the yogurt, even better!! I could use a couple of these beauties right about now! Given how much I enjoyed your raspberry crisps, I must make this ginger peach version! 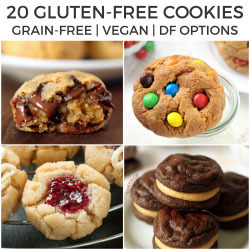 Love that you used almond flour… I actually have some on hand that I've been meaning to use =). I've never thought about a grain free crisp, what a cool idea! oh my… I was so surprised when I saw the peach inside. what a yummy combination: the dark crumb, the soft peaches and the fresh yoghurt and blueberries. totally gets thumb up. Ha! I love that you ran out of peaches. ;) These look delicious!